This week we begin a new message series we are calling, “I come to do your will.” We read these words on the lips of Jesus many times in the gospel passages, it is in the psalms and we see them in the letter to the Hebrews in the fourth week of our series. Jesus says he did not come on his own but he came to do the will of his Father. What an example we receive from Jesus, doing the will of the one who sent him. We want to look at the coming of Jesus, and prepare for a season of anticipation and waiting. Looking at the readings over the next weeks leading up to the great Christmas celebration we see the purpose of Jesus coming. In this first week we look at the promise. God made a promise to the house of Israel and we read that the days are coming when God will fulfill his promise. God promises through covenant, and God keeps his promise even when the covenant has not be fulfilled by those to whom God has made promises. It is the power of God’s promise that brings justice and righteousness, strength and the teaching of a new life, a life where we stand tall in front of God, the Holy One. So this week we look at promise and how God always fulfills his promise. 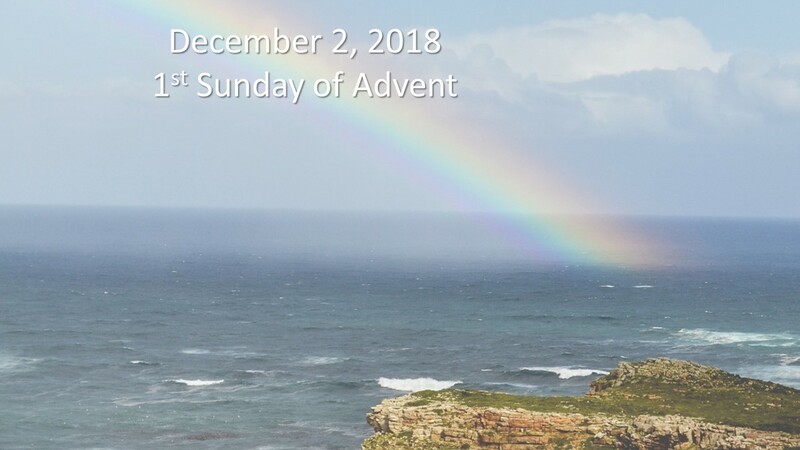 The readings this week are from the Lectionary for the First Sunday of Advent, derived from a Latin word, advent means coming. The readings are; Jeremiah 33:14-16; Psalms 25:4-5, 8-9,10, 14; 1 Thessalonians 3:12-4:2 and Luke 21:25-29, 34-36. Each of these readings gives witness to coming, they anticipate the coming of a Messiah, first to save and second to judge. It gives us the double look, Christ has come and Christ will come again. We have this promise from God, we can see where it has been promised and we can ready ourselves for the fulfillment of God’s promise. We see God’s will is to bring justice, love and that we may stand tall before the Son of Man. God does all to fulfill the promise, we need to be ready to receive God’s will. The first reading is from Jeremiah (a prophet) speaks about the new covenant; God says the days are coming when I will make a new covenant … I will place my law within them, and write it upon their hearts … everyone will know me … for I will forgive their iniquity and no longer remember their sin. (cf. Jeremiah 31:31-34). God makes a new promise and in this first reading from Jeremiah God is speaking about the days that will come when this promise will be fulfilled. God explains a new shoot will be raised up from King David. This promise speaks of an ancestor from the line of King David, Jesus who will come and do what is right, he will make Jerusalem secure. He will be called “LORD our justice.” God promises this new covenant even as Jerusalem has failed several times in keeping the old covenant. Rather than being a covenant with the nation, this new covenant will be with individuals, all individuals who receive it. This is God fulfilling his promise and Jesus coming to do God’s will. The second reading from the First Letter to the Thessalonians speaks of love and receiving others. The opening verse speaks of increasing love for one another, strengthen hearts, being blameless and holy before God at the coming of Jesus. We should love all, we should not restrict our love in any way. In this way we are imitating Jesus, and becoming more holy, letting God be more fully alive in us. Paul addressing the community is speaking about Jesus coming the second time to meet all and judge. Paul wants everyone to be like Jesus and gives instruction on how to love, saying no matter how much you think you love, do more. We can never love too much. If we thought Jesus would return tomorrow, how would we act today? Paul writes telling the community to live as Jesus will return any moment. The promise of Jesus coming could occur any time, we should be ready to receive Him. Our promise can be fulfilled when we love everyone and live imitating Jesus. In the gospel of Luke we see a description of what it will be like when Jesus returns. There will be signs in nature and people will be afraid, even the powers in heaven will be shaken. The Son of Man (this is how Jesus referred to himself) will be coming in power and glory. When we see these signs we should stand erect, redemption is at hand. Until that time we must be alert, ready for this coming, ready to receive Jesus in these moments, standing proud and joyful. As we get ready we should also be hopeful, this is the Kingdom of God coming to us. It is God’s promise, that we will have the opportunity to live with him. We are not home away from God, our home is with God and we will have a chance to return home thanks to the promise of God, which we read will be fulfilled, even if we do not know when. This prophecy may not happen in our life time, but at some point we will meet Jesus. We need to be ready by receiving Jesus in our hearts today and imitating his message of love. We are looking at these three readings from the view that God’s promise will be fulfilled. God fulfills his promises by sending Jesus, his son once to do his will. God will send Jesus again and Jesus will do God’s will a second time. God’s promise only requires that we receive it and then act like the one who fulfilled that promise, Jesus. Jesus teaches us many things about how to be with others. Most of what he teaches is about what we should do. All of Jesus life is an example of how we should live our life. He loved so we may know how to love. He forgave so we may know how to forgive. He healed so we may know how to heal. Nothing that Jesus did was self-centered, all he did was the will of the Father. Jesus entire life is an example for us to know how to live like him. Jesus was fully human, all he accomplished can be done by us. God’s promise to send Jesus so we may live our life to the fullest, without sin and with the hope of salvation. God keeps promises, it is up to us to accept these promises and be ready for what is coming. What does it mean when we make or receive a promise? It is an assurance or declaration of something we will or will not do, give, an expectation. When we tell someone we will be somewhere or do something for them we are promising, even if we do not declare that we promise. But we do hear this declaration more and more, “I will meet you, I promise.” Saying we promise we feel we are given more strength to our words, we create an expectation and we assure that expectation is true by saying, “we promise.” I think we try not to say we promise unless we are sure we will accomplish what is promised. It becomes a stronger guarantee. God’s promises come in the form of covenant. A covenant is an agreement, a promise by two parties to do or not do something. It sounds stronger than a promise and it tends to have agreement from both sides. But God’s covenant is his promise, he makes it available without any up front agreement, he hopes that we will accept the covenant and respond with our own promise to achieve the agreement. The Mosaic covenant is an agreement between God and the people of Israel, it defines most of the story called the Old Testament (a synonym for “covenant” or “contract”) in the Bible. It is the story of God and the people and their promises to one another. But it is a covenant with the nation of Israel. The new covenant discussed in Jeremiah 31:31-34 makes the way for Jesus coming and the new covenant promises Jesus makes that opens the way for a covenant relationship to believers in all nations. The new covenant reads, “Then he took the bread, said the blessing, broke it, and gave it to them, saying, “This is my body, which will be given for you; do this in memory of me.” And likewise the cup after they had eaten, saying, “This cup is the new covenant in my blood, which will be shed for you.” (Luke 22:19-20) This is repeated in the Gospels of Matthew and Mark (Matthew 26:26-29, Mark 14:22-25). This new covenant Jesus makes intends to bring all people to God and does so by offering himself as sacrifice for the forgiveness of sins. This is the fulfillment of God’s promise, it is the coming we witnessed when Jesus came as a baby on Christmas day and it is a coming we anticipate again. In each of these covenants God is deepening his relationship with the people. He launches each covenant off the previous, the new covenant fulfilling the previous. This new covenant that Jesus announced and fulfills is what we are called to live by today. We accept Jesus and we accept this covenant. We receive the promise of God wishes to fulfill. As we discussed in the opening, Jesus total life was a promise to do the will of the one who sent him, his Father, God. It is how we should respond when accepting the promise of God. God promises an abundant life, security, justice, righteousness, escape from trial and tribulations. The days are coming when the new covenant will be fulfilled and we want to stand erect and welcome God, proud of how we too live to do the will of the Father. How we do that begins every day. We must love God by loving others. We must do all we can to imitate Jesus, love as he loved, forgive as he forgave, heal as he healed, refuse to be self-centered but be selfless, always trying to do the will of the Father. It is simple to know, difficult to do. Yet by doing it we fulfill a promise to God and make the covenant work. When my wife and I had our third daughter she had a diagnosis of spinal meningitis, we didn’t know what it was but where shocked when we heard the specialist say to us, “We think she is going to live.” We had no idea how serious things were. I began making promises to God if he would take care of our baby and make her whole. I promised to quit drinking which had become a problem for me. God did save her and made her whole, with no lasting debilitation. I kept my promise to God. It worked out better for me than for God all around. My daughter is now having her own beautiful children I get to enjoy and my life which was off track, straightened out with my leaving alcohol behind. While this to me was covenant, it is not what God requires. God provides our best life, if we let him. God used what happened to my daughter to better my life. All we have to do to be in covenant with God is to receive his covenant. We live knowing that we are trying to do God’s will and God fulfills all his promises to us. This is how we should look forward to the coming of God’s promise, by accepting God’s promise and living in such a way that we are doing God’s will. As I discovered it makes for a better life for us and readies us to stand tall ready for the coming of the promise of God.